Sowing seeds in a nursery has many advantages, the greatest of which is that it enables certain plants to start growing in ideal conditions. Young plants are then transplanted one or more times until they reach their final growing bed in your garden or vegetable patch. 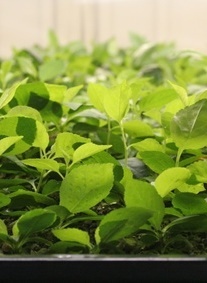 A sunlit spot of your garden protected from wind will be the perfect place for seedlings to start. 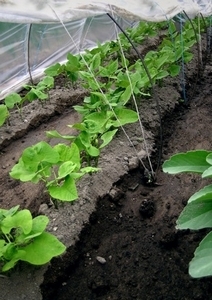 A pane of glass or a tunnel greenhouse are more than enough to protect your seedlings. Clear the plot of land to clean it and remove roots, rocks and weeds. Break up hard soil to make it lighter. If needed, add a bit of organic matter (manure and seaweed-based fertilizer), mixing it into the ground. Dig furrows with a spacing of 3 to 6 inches (10 to 20 cm) depending on the plant you are sowing. Sow the seeds in a line (for vegetables) or in seed holes (larger seeds), spreading them out evenly. Fill in or cover with seedling soil mix. Press down lightly with the reverse side of a rake.